A week book-ended by matches against the team at the bottom of the league to the team at the top of the table, via somewhat appropriately, a team in mid-table. You could almost write a mathematical formula of twisted logic applying to Bradford City over the years when faced with such a run of fixtures. So of course, now firmly ensconced in the “you could make it up” territory, a brilliant City side ran out worthy winners against the side at the top of League One, in a manner that was a million miles away from the Colchester capitulation, not to mention massively above the mediocrity of the Bury game. I probably could have written this match report before the match started. From “forget it” to “get back on it” in the space of a week. To the complete outsider you would surely have more luck on the black or red of the roulette wheel. Thanks to the rain and floods on Boxing day which forced the original home match to be postponed and re-arranged, it was only just over a month since the Bantams last faced Burton; the 3-1 reverse at the Pirelli Stadium at the start of February was a disappointing result and performance, but prompted an upsurge in February and, despite the Colchester set-back last week, saw the Bantams approach the match still just about managing to cling onto the coattails of the promotion pack with a game in hand. An important but tricky game in hand against a Burton side who have been epitomised by their solidity and ability to grind out results this season. City were forced into a defensive change following Rory McArdle’s dislocated shoulder at the weekend match at Bury. As expected, this meant a return to the side for Nathan Clarke to reprise a partnership with Reece Burke, that has so far had a solitary, but successful, match against Southend. Elsewhere Phil Parkinson sprang a couple of surprises, Jamie Proctor replacing James Hanson, who was suffering an illness, and Billy Clarke was brought into the side at the expense of Wes Thomas. Nigel Clough made a couple of changes to his Burton outfit. Stuart Beavon and ex-City loanee, Tom Naylor returned to the starting line-up, replacing Callum Reilly and a further ex-City loanee, Mason Bennett. Jon McLaughlin made his first return to Valley Parade and was given a warm reception befitting a “History Maker”. Burton began the match with the confidence expected of a team at the top of the league, and it took the Bantams a little while to settle down and get into the match. Having said that the first real opportunity fell to Jamie Proctor whose header almost wrong footed McLaughlin, but ended up falling onto the roof of the net. City grew in confidence and began knocking the ball about well – it was good to see an intensity to the play and the ball was passed around both quickly and, perhaps more importantly on the deck, to good effect. This culminated in the first goal of the game on 13 minutes which Billy Clarke played a very important part in. A ball into the box played Clarke into the penalty area and he showed great intelligence to weigh up his options, spread a perfectly weighted pass to the left into the onrushing Kyel Reid, who smashed the ball into the net. A neat move and an emphatic finish from Reid, and it was also pleasing to see Clarke start to rekindle the inventiveness and clever play he showed last season. Another early goal though, would we collapse as in the previous week? Well, Burton responded as could be expected and began to force some pressure on the Bantams defence, which thankfully managed to stand firm. Ben Williams made a good block on 20 minutes and the City back four also made some crucial blocks as the Brewers tried to get back into the game. However, as the game progressed Burton visibly became more frustrated, indeed there were a number of poor/rash challenges – Reid and Billy Clarke were amongst the victims which saw Burton players receive yellow cards and it was clear that City had rattled their opponents. As the game developed Reece Burke looked his usual cool self and appeared keen to add to what are fast becoming his trademark marauding forward runs. Additionally, Reid absolutely terrorised the Burton defence when he went forward – his pace and running caused havoc and was complemented by some decent crosses into the penalty area. Things got even worse for the away side on 28 minutes. Again Billy Clarke was in the thick of things and after his shot on goal could only be parried by Jonny Mac, Reece Burke was on hand at the left of the goal to drill the ball home. 2-0 up and the Brewers did droop for a while, but ended the half on the front foot. A spell of away side pressure approaching half time meant that City looked relieved for the half time whistle, one that referee Trevor Kettle managed to blow without any controversy (ie after his Accrington “episode” at the weekend). Burton were first to return to the pitch after the half time break, presumably after a strong half time lecture from Nigel Clough, and had City on the back foot after the restart. For a while the Bantams struggled to string any passes of note together or retain possession but the Brewers were not able to capitalise on this. Indeed, City grew back into the match, a shot from Reid and Billy Clarke also played Proctor in, but his effort cleared the bar. As the half progressed, and whilst Burton threatened, City generally dealt with what was thrown at them whilst also posing questions of the Burton defence, and perhaps were even a little wasteful with what they created. There was always the nagging fear that this might come back to haunt us. Referee Kettle also played a part with a more than average number of debatable decisions which seemed to favour the opposition during this period. This wastefulness reached its zenith on 79 minutes when City (after a couple of potentially decent earlier appeals) finally won a penalty, Burton’s Mousinho handling in the box. Tony McMahon stepped up to take the penalty but Jonny Mac was more than equal to the task, tipping Tony Mac’s effort around the post. To be fair not the greatest penalty, from what seemed a fairly short run up, but we have witnessed Jonny Mac’s penalty saving prowess in the past, so it perhaps wasn’t a surprise. Furthermore, at least we didn’t try to recreate a Barcelona Messi pass to Suarez style effort. Having said that it was still a massive chance for the Bantams to completely wrap up the match, particularly against a side who you wouldn’t have discounted retrieving things if they had got a goal back, and doubly disappointing given the number of penalties we are awarded! As the match played out, City even managed to maintain their impressive ability to receive bookings for not taking throw-ins quickly enough, a bug-bear of mine but to be fair, James Meredith’s yellow card did look a tad harsh and perhaps if nothing else gave referee Kettle another chance to demonstrate his pedantic nature. 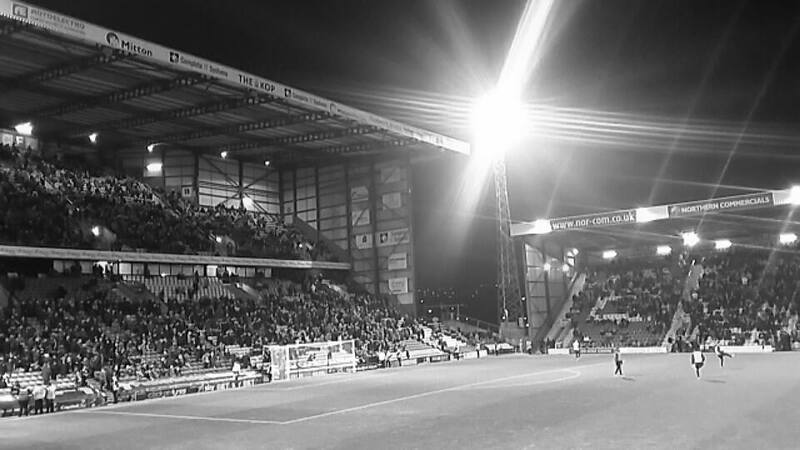 So, overall a fantastic performance with some absolute “stand up and be counted” performances across the whole of the City line up; definitely a game that typifies everything that makes a great evening at Valley Parade, and helps counter the low points we have to endure from time to time! For me Jamie Proctor epitomised everything that was good about the Bantams tonight. Given an unexpected starting berth, he completely grabbed this with both hands and made the most of the opportunity. A performance that married graft and hard work with a good deal of clever running and hold up play, and was a delight to watch. Towards the end of the match he had even run himself so much into the ground, that he could barely make a lay-off to Marshall, the pass virtually trickling off him. Overall a fantastic performance and one that gives Phil Parkinson a nice dilemma for Saturday’s match. It was also encouraging to see Billy Clarke back into the groove. Okay, everything didn’t quite come off for the Irishman but make no mistake he made a big difference tonight. Having him play deeper perhaps helped nullify Burton’s packed midfield, and the first half particularly, saw Billy instrumental to City’s attacking intent. Josh Cullen again had a fantastic game and seems to have an ability to be at the heart of breaking up the opposition’s attacks with his tigerish ability to tackle, head and generally make a nuisance of himself – he must be a nightmare to play against. It is to be very much hoped we extend his time here and reap the benefits of his development over the rest of the season. Nathan Clarke also had an excellent performance and removed completely any worries concerning the absence of Rory McArdle – after a slightly shaky start to the season Clarke has not let anyone down whatsoever, and certainly played his part in yet another clean sheet that the City defence can be very proud about. Whilst picking out a few players, it must be said that the whole team played their part in the victory tonight. Where does this leave us in this very topsy-turvy season? Well, on the face of it, very much in contention – 7th place in the league isn’t exactly shabby at this stage. However, inconsistency is the name of the game in League One this season and it remains to be seen if we can build on this result when Doncaster visit on Saturday. It was good to see one of Parkinson’s tactical plans pay off. Having Clarke helped ensure Evans/Cullen weren’t overrun by the Burton midfield. Proctor is a good foil for Clarke in that he holds the ball up rather than flicks it on. I was impressed by Proctor all round, I’d assumed he was destined for maybe a couple of sub appearances and then released in the summer but there may be a future for him after all. He was absolutely knackered at the end though, and rather bizarrely none of Thomas, Knott or Routis had done any warming up during the game so we ended up with just the one sub. Good report Damien, thanks. Loved the pun. I think Nathan Clarke has shown us that next season with a pairing of him and McArdle (can’t see us getting Burke back unfortunately) should see us pretty solid at the back. For what it’s worth I’d like to see Clarke as team captain and Darby as club captain next year, I think that at times we’ve missed someone on the pitch to give people a rollicking – which Clarke does pretty well. Good summary of last night. A couple of points, Burton were the worst table-topping team I’ve seen in recent times. Secondly, there should be no dilemma about Saturday’s team selection. This was a centre forward’s display the like of which we haven’t seen for sometime and he hadn’t played for ages! Lets face in this game anything can happen, as we have seen this week. This division is a strange one too with no consistency, as PP has pointed out several times and I believe Walsall, Coventry and others will agree. Barnsley may blow up, someone will hit a sticky spell before the end, and some one might come from nowhere (as we did two seasons ago). What I have learned in fifty seasons is not to rule anything in, or anything out in football. I think we can get a play off place and to be honest then its down to three cup ties and again anything can happen.